I worked my first farmer's market of the season today. I've peddled organic produce for the same Skagit Valley farmer for the past six summers. It's always special for me when market season starts- I get to return to my community of creative, industrious and earthy people. I started coming along to market with my mom when I was about ten or eleven years old, and used to help her sell her handmade goatmilk soap. If I was lucky I'd get $5.00 to spend as I ran around the grassy marketplace in my barefeet with my little brother. Such wonderful summer memories of spending time with my mom with a cold Cherry Bomb Special in hand (an amazing fizzy drink one of my favorite vendors used to make). My mom still comes to market, but she's had quite a lot more to sell these past few years, ever since starting the tomato farm. Along with her awesome goatmilk soap, she'll usually bring all sorts of tomatoes, cucumbers and garlic, dried lavender blossoms and jars of honey. I've met so many interesting characters over the years...I figure someday I might have to write a book about it. There was the iron worker who was nearly seven feet tall (I'm sure he was only six feet, but when I was little he was ginormous). He had a thick, black beard and a big old belly and would show up to market with an assortment of iron garden art: big, metal black flowers, birds, vines, gates and the likes. To set up his wares he'd just toss them right out of the van, *crash* *clang* *clang* on top of each other. Then there's my favorite honey vendor who always comes to market with his portly australian shepherd (who loves pasta and cheeseburgers). This particular honeyman has a huge heart and a hearty cackle to top it off. He's always sharing stories of his younger years with me (like the time he lived in Panama) and sharing business advice. Right now he's learning how to produce his own Queen bees, and he also raises canaries and pigeons. And then there's the farmer I work for. Anyone who's met him knows he's quite the character. He's notorious for showing up late to market, but that's just because he always has the freshest produce (and probably the best). I definitely have to credit my sleuth with cooking vegetables, and my knowledge of weird heirlooms, to working for this guy. He's chalk full of the coolest recipes and really tries to bring something different to market such as several types of fingerling potato varieties, squash blossoms, wild mushrooms, pickle weed, huckleberries, golden raspberries, striped tomatoes, kohlrabi, celery root, purple basil, lemon sorrel, pink and white striped chioga beets, kale flowers, asian pears and so much more. Anyway, my first market of the season rocked. My farmer brought along his family, so it was like a little reunion. His daughter even made us all vetch crowns (I'm wearing mine in the picture above). All of the customers seemed happy to see us, and excited to have good food in their neighborhood once more. This spring has been so cold that it was certainly a hopeful sight to see produce out on the tables: arugula, spinach, kale, radishes, leeks, spring garlic and onions, chives, cilantro, parsley, potatoes and plant starts. 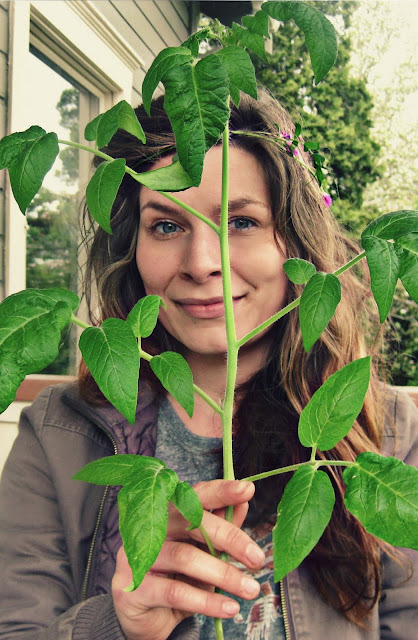 Speaking of plant starts, I am also happy to announce that I was able to move out all of my tomato starts to my greenhouse today after the market (I'm holding one of my starts in the photo above). I was also able to plant celery, basil and pickling cucumber starts next to the tomatoes as well. I'll be sure to post a more detailed blog about my greenhouse setup in the the coming days. Now, I'm going to sit back and relax and enjoy some homemade rice pudding I was gifted by the Italian pasta vendor. What a good day! our homestead: oh hey, potatoes!